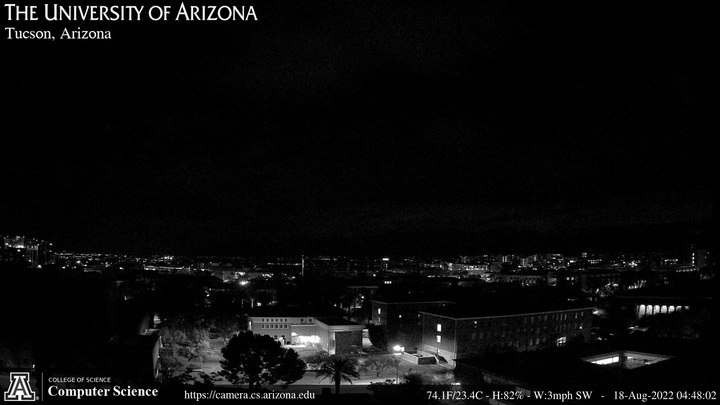 Stay updated on the University’s and Arizona’s weather forecast with four webcams on campus designed to keep you informed. Provides graduate training and research in all aspects of hydrology and atmospheric sciences and related fields. Shows monthly averages of extreme temperatures, relative humidity, rain and cloudiness. The latest measurements from the weather station at the Physics and Atmospheric Sciences Building. The Computer Science department's Arizona Webcam looks north across the University of Arizona campus to the Santa Catalina Mountains. The vantage point is a window in the Gould-Simpson building. New images are generated every 3 minutes. A view of the Santa Catalina Mountains looking north across the UA campus from the Gould-Simpson building. A new image is generated once a minute. Time-lapse movies collected by the Arizona Webcam. A view of the UA Mall from the top of the Student Union.